I came across this fun little game today... 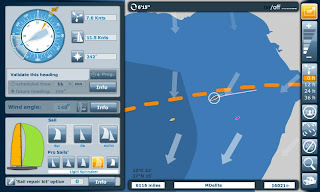 It is the Virtual Volvo Ocean Race. You get to skipper your virtual yacht against thousands of people around the world, AND the real-life yachts of the Volvo Ocean Race going on right now. It different from fairy-tale football, where you just pick some players and hope they do well for you. If you screw this thing up, it is all on your shoulders... You picked the course, and the sail. There is no fantasy here! Unlike your typical addictive flash game, this game is a commitment. If you look at the picture above of my dashboard, I have 6116 nautical miles to go. ...On the first leg. ...Without a fast forward button. The race won't be finished until June 27 of 2009. I think this will be a good test for me as it is totally against how our "right now" society works. Can I sail this thing through to the finish? We'll find out. If you want to join me (it's free, and easy) be sure to buddy up with me. My boats name is 'mdelite'. No worries that the race has started, they place you in the back twenty percent of boats. My goal for this leg is to see if I can finish in the top fifty percent. BTW, they charge for some options like an autopilot and such. Lame. I'm sailing 'old school'. I'll set my course before I go to bed, when I get up, when I eat lunch, and when I get home for work. Hopefully I won't hit any islands or continents!